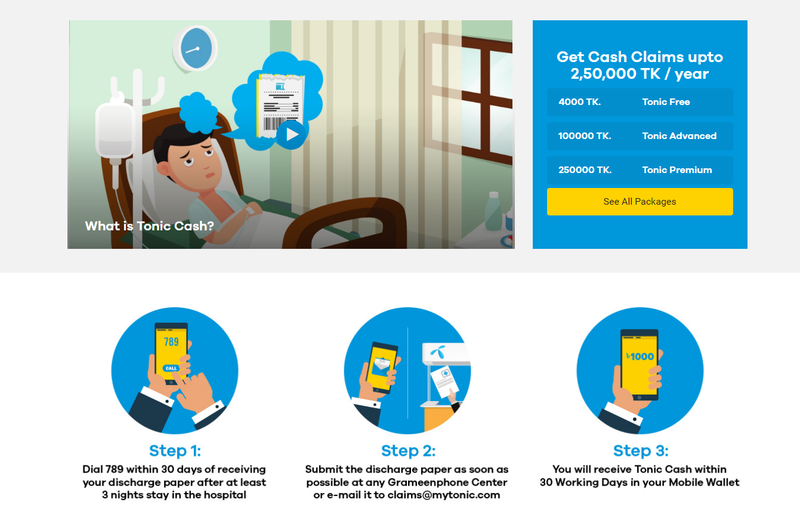 Telenor Health’s digital health-care service, Tonic, is the digital master plan to live well. Tonic is the result of an extensive research and development process with inputs from global experts, local medical practitioners, and everyday people. It is a free to register service and the members are offered a set of unique package benefits. Tonic Cash can be availed by a Bangladeshi person. If a member is hospitalized for three consecutive nights or more, s/he gets the cash paid directly to his/her banking wallet. Members can claim Tonic Cash up to four times a year. Tonic Cash serves to mitigate the financial risk associated with health-care expenses. Understanding the needs of Bangladeshi customers, Tonic Cash provides maximum cash coverage of up to Tk. 250,000 a year. If any Tonic Premium member is admitted to any registered hospital in Bangladesh for three consecutive nights or more, they will receive Tk. 25,000. Tonic Premium members can avail this offer for up to ten times a year. Tonic Advanced members will get up to Tk. 100,000 (Tk. 10,000, 10 times a year), and Tonic Basic members will get up to Tk. 4,000 (Tk. 1,000, 4 times a year). Telenor Health has been keeping its promises to its members in paying back cash on time. Significant number of people have already availed the benefit which shows that people need more affordable options for healthcare services. Members from Noakhali, Sylhet, Rajshahi and other districts of Bangladesh have claimed cash already and will be given Tk. 25,000 (as premium members). Telenor Health has made Tonic available in every corner of the nation. “Tonic has introduced greater convenience in my life. When I am unable to visit a doctor in person, I can avail healthcare through my phone,” says a Tonic user from Noakhali. Development in healthcare services plays a major role in the development of the whole nation. Digital and accessible health-care service is the next big step towards reaching the Sustainable development goals for Bangladesh. Tonic also allows its member to access health service digitally, including access to medical professionals, health content vetted by trained doctors and discounts from hospitals through their smartphones. Customers willing to avail Tonic Cash has to follow some simple steps. For step 1, a member needs to dial 789 within 30 days of receiving the discharge paper after at least 3 nights stay in the hospital. Then the member has to submit the discharge paper as soon as possible at any Grameenphone Center or email it to [email protected] Finally, the member will get an SMS of receiving Tonic Cash within 30 days in the mobile wallet.